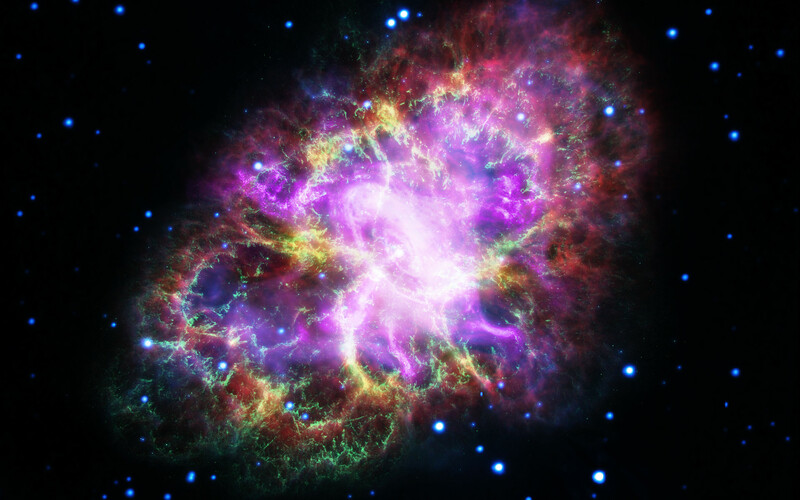 This captivating new image shows the Crab Nebula in bright neon colours. The unusual image was produced by combining data from telescopes spanning nearly the entire electromagnetic spectrum, from radio waves to X-rays. The Karl G. Jansky Very Large Array (VLA) provided information about the nebula gathered in the radio regime (coloured in red). NASA’s Spitzer Space Telescope took images in the infrared (yellow). The NASA/ESA Hubble Space Telescope provided the images made in optical wavelengths (coloured in green). 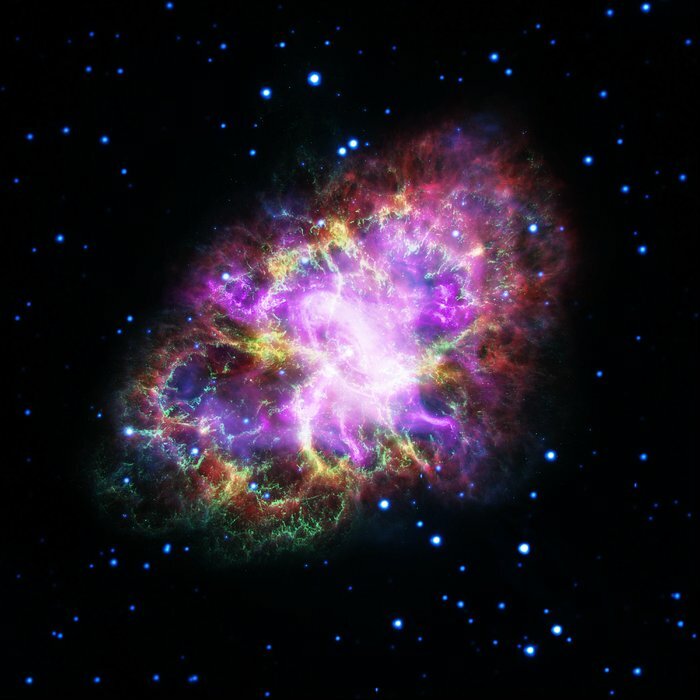 ESA’s XMM-Newton telescope observed the Crab Nebula in the ultraviolet (blue) and NASA’s Chandra X-ray Observatory provided the data for X-ray radiation (purple). The Crab Nebula, located 6500 light-years from Earth in the constellation of Taurus (The Bull), is the result of a supernova explosion which was observed by Chinese and other astronomers in 1054. At its centre is a pulsar: a super-dense neutron star, spinning once every 33 milliseconds, shooting out rotating lighthouse-like beams of radio waves and visible light. 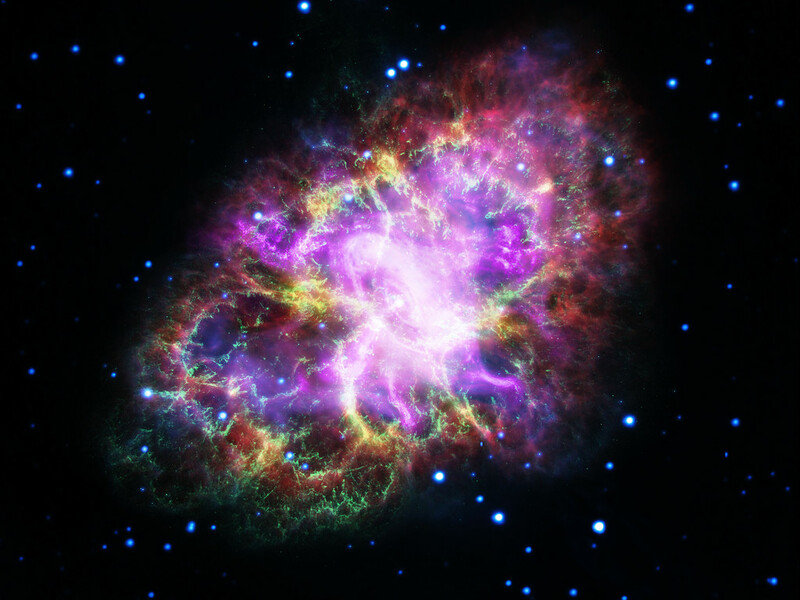 Surrounding the pulsar lies a mix of material; some of it was originally expelled from the star before it went supernova, and the rest was ejected during the explosion itself. Fast-moving winds of particles fly off from the neutron star, energising the dust and gas around it. These different layers and intricacies of the nebula can be observed in all of the different wavelengths of light. Position (Dec): 22° 0' 54.45"